It is quite common for students to have nervousness in their study life which adversely affects their learning cycle. For some students, the anxiety is only mild and is seen only at exam times but it can be an alarming issue for certain students. 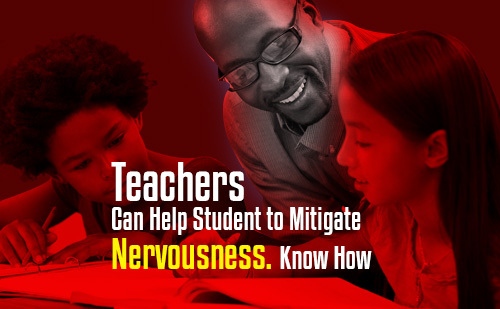 Whether the nervousness is mild or a serious disorder, teachers can play a crucial role in alleviating it to a great extent. Some deliberate changes in the way they approach these students can help them a lot to overcome these mishap and have a productive learning phase. For students with exam fear, the anxiety of covering large portions of syllabus in the stipulated deadline is the major problem. Teachers can help them to create a realistic study schedule by which they can complete important lessons more productively. You can help them to allot their time effectively to cover all of the subjects in the time frame. Help them to relax their body and mind with some tips. This can include taking deep breathing exercises whenever they feel stressed. Advice the students to follow their mantras and promote positive self-talk. Seated stretches are one of the good ways to remove tension during exam times. An idle mind is a devil’s workshop. Students with anxiety problems used to think a lot and this makes the problem worse. So teachers should take up some steps to keep them busy with some interesting activities during their free time giving no way for unwanted thoughts. Keeping them physically and mentally active with some productive schedules can do the trick. Teachers can take deliberate efforts in promoting positive thinking with some valuable speech every day. You can share the success stories with the students to help them learn how the hard work actually pays them back. Another option is to write down a new positive thought in classroom black board every day which motivates them to think positively. Students would always be comfortable with kids of their age group. So it would be good to organize some peer study groups with students of differing calibre. They can teach and learn from each other and share the ideas in groups during free hours which bring in lots of positive vibes. It is not a good idea to blame them all of a sudden when they score badly in main exams. Instead you can conduct mini tests all through the study term and give them continual feedback on ways to improve. This would help them to re-frame their study approach effectively and take effort to perform better every next time. This takes away their exam fear and helps to approach the main exams with confidence. It is not good to burden them with unrealistic assignments that kill their self study time. Teachers should consider giving them small portions of flexible assignments and make the deadline for completion more realistic. You may also give friendly advice to present the assignments better next time with constructive criticism. Students would always love to hear words of appreciation for the work they do. So take some time to praise them for the little efforts they take. Even if they fail in their first or second attempt, praise them for the effort they took in doing it. This would inject positive vibes in them and lifts their self confidence to do things better and try something new without any fear. As we all know, practice makes a man perfect and there is no gain without pain. So it is important to teach them the importance of practice. Make them understand that success may not always come their way in the first place; instead they have to achieve it one day through practice and hard work. Make sure that no students in your classroom are bullied for any difference. See that there is no gender or caste or cultural discrimination in your classroom. Give them a feeling of safety and take an effort to make everyone in the class feel valued. Also see that there is proper student engagement with learner-centered activities. All students in the classroom may not be of the same calibre. So it is good to include activities that help every type of students to understand the lessons. If you see that certain students are too weak in some lesson areas, spend some time to give them additional help to make them compete with their peers. Being physically active in the classroom can also help them to have some positivity. Include activities that ask them to come out of their seats and interact with others and explore new ideas. Making them communicate well with their peers is another way of erasing their anxiety problems and to help them stay positive. The fears can be different for different students. It is the role of teachers to spend some time for them to make a friendly conversation. This helps them to identify their personal fears and take effort to ease it to an extent. You may also have a chat with their parents if things seem serious and not handy. A comfortable atmosphere to study gives them a feel of goodness. You may consult with the management to make some proper seating arrangement. Also make sure that the lighting is proper inside the classroom. You may also bring in some light music in the classroom to ease of the pressure. Burdening students with lessons throughout the day can invoke stress and this can create nervousness in them. Teachers can initiate steps to make sure that they are getting proper leisure time in the middle of all lessons. It is important to free up their mind and help their body and mind to relax. The lack of time management is the reason why many students fail to complete the lessons on time. This paves the way for unnecessary fears and anxiety, especially during exam times. So teachers can help them learn the importance of time management which takes away most of the associated fears. Maintaining good parent teacher relations can help a lot to identify the student’s personal fears. This helps teachers to take some cautious steps to approach a student with anxiety disorder. 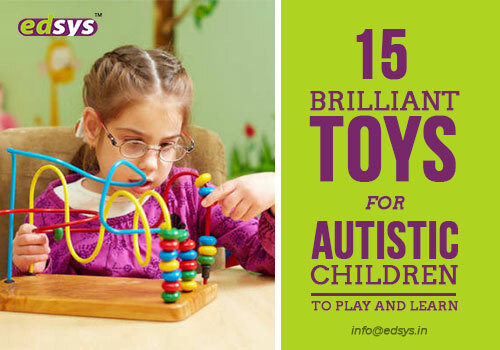 This also helps teachers to properly convey the child’s activities in school and seek help from parents if needed. It is important to do the things you love to make it more enjoyable. Teachers can give enough support for them with timely advice to make learning more easy and joyful. Devise a teaching style that helps them to learn with fun rather than giving them a feeling of serious study time. Teach them the importance of balancing their time effectively to enjoy all phases of life. Help them to allot their daily time wisely for studies, friends, parents, play and rest to balance their life properly. Similarly, teachers can also make the exams balancing by trying open book tests or creative exams to enhance their confidence. A friendly classroom setting can help students to be more free and relaxed. Keep up a good ambience in classroom which motivates every student to express freely and share their ideas. Make the setting comfortable enough for even the shy students to express themselves and see that students are keeping positive relations with one another. It is highly important for you to keep yourself relaxed while approaching students. Keep away your tensions and approach a classroom with a positive attitude. This would be highly inspiring for them to maintain a positive outlook in life despite what all comes their way. It is important for teachers to set an example of the principles you are conveying to the kids. Giving a clear picture of the objective of lessons and the purpose of learning erases away their feeling of uncertainty and anxiety to a great extent. Let them understand that they can freely approach teachers or parents for any support and guidance. Teach them that making mistakes are quite human and there is no need to lose hope over a single failure. School management can take some effort to arrange personality development and confidence boosting sessions by experts once in a while in addition to the regular text book lessons.